Outside, the ground is alive; it’s soil. When it gets on your hands and clothes and you bring it inside it becomes dirt—sand, silt, and clay. It dries out and the organisms die. The organisms in the soil form an entire ecosystem or a soil food web—from microorganisms like bacteria to top predators like black ground beetles. Here is the invisible part of what we commonly think of as the food chain; the decomposers responsible for decay. Organic matter is an essential part of soil, the storehouse of nutrients and energy. Bacteria utilize the fresh plant material while fungus typically consumes fibrous plant matter, wood, and humus. Humus results from many organisms using and transforming organic material to the point that the original material can no longer be identified. Soil organisms consume the physical plant remains until the detritus is reduced to sugar, starch, proteins, and other organic compounds. The process occurs more slowly with the plant fibers of lignin and cellulose. Along the way soil microbes grow, reproduce, die, and decompose. When the original remains of matter are dark, spongy, and smell earthy, we call it humus, one of the building blocks of topsoil. Rather than burning up as CO2, this carbon can last in the soil for hundreds of years. 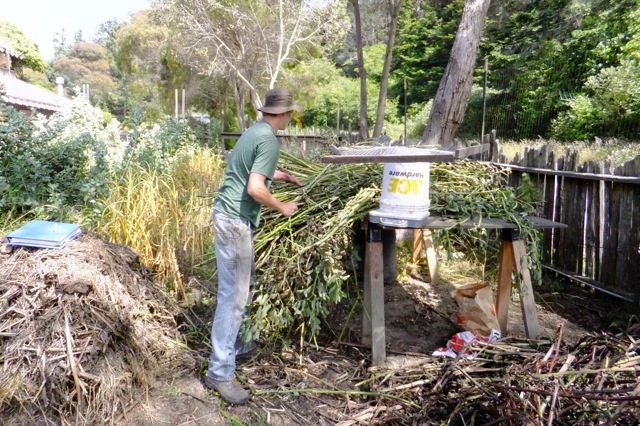 Composting is a technique that produces an organic material that mimics the leaf litter of a forest floor by applying the principles of the soil food web. Compost is made by layering organic matter in combination with air; water; and soil or compost inoculant to provide a feast for decomposers. Compost made from materials grown on the land where it is applied is most similar to an ecological cycle, especially compost comprised of materials high in carbon that slowly decomposes. Ecology Action has pioneered the work on this. What is soil carbon sequestration and how does it reduce greenhouse gases? Understanding the potential of carbon sequestration allows us to stabilize and even reverse global warming, since one-quarter of the total excess of carbon in the atmosphere comes from agriculture. Plants use the sun’s energy to draw carbon dioxide from the atmosphere in the process known as photosynthesis. Plants separate the carbon and oxygen to form sugars. These sugars are transformed into more stable forms of carbon compounds. Some carbon moves from the plants roots into the surrounding soil and can remain bound and sequestered. Sustainable practices that mimic this natural process include compost-making, green manures, and growing compost crops, food crops that are high in carbon. Compost can reduce atmospheric carbon and other greenhouse gases by increasing the amount of carbon stored in the soil. Compost reintroduces soil microbes to soils that have been damaged by chemical fertilizer and pesticides. Compost feeds soil microbes that in turn release enzymes and hormones that promote healthy plant growth. Compost is a form of plant fertilizer; humus organic acids help dissolve soil minerals, making them available to plants. 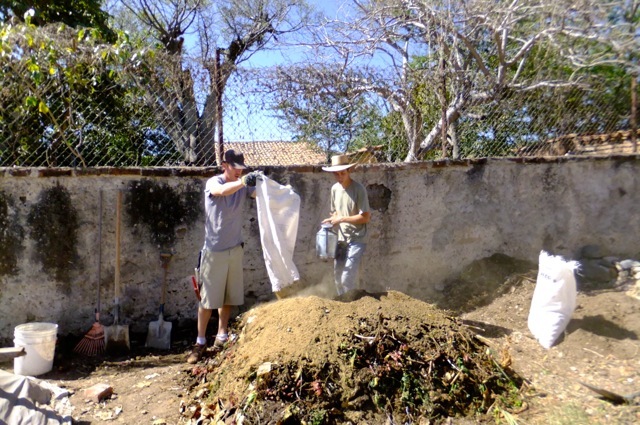 Compost provides beneficial microorganisms that protect plants from pathogens. Compost prevents soil erosion by improving soil structure. Compost adds microorganisms that breakdown toxins in the soil. Compost can buffer soil pH. Matt Drewno, Ecology Action Greenbelt Garden Manager with fava bean compost crop.